"What you are seeing is they are trying to build a case on Laquan as if he is the perpetrator and not the victim," said the teen's great uncle. CHICAGO — Now it is Laquan McDonald who is on trial. 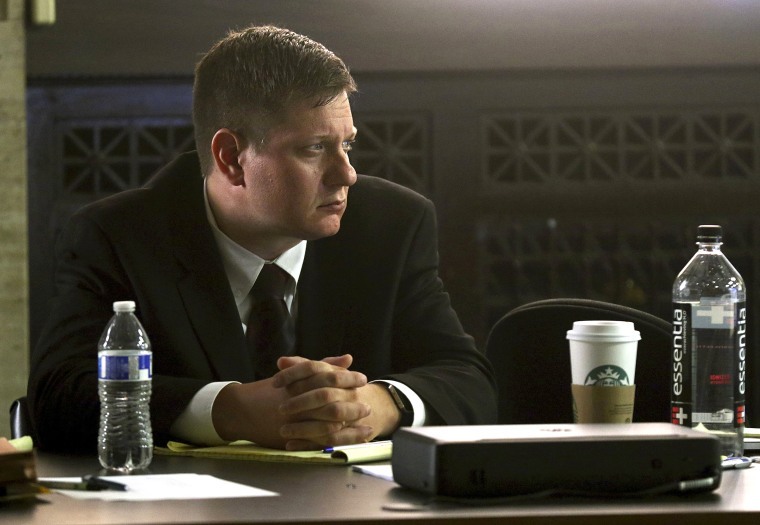 After days of prosecutors making their case to jurors that Chicago police Officer Jason Van Dyke committed first-degree murder in 2014 when he shot the black teenager 16 times, attorneys for the white officer are presenting their own evidence. Their contention: The teenager was a violent, dangerous, knife-wielding suspect on “a rampage” whom Van Dyke was forced to kill. The shooting happened after police were called to a report of someone breaking into trucks. Testimony and video shows officers had McDonald largely surrounded on a city street and were waiting for someone to arrive with a stun gun to use on the teenager when Van Dyke pulled up, got out of his squad car and started shooting. Squad car video shows McDonald was veering away from police, a knife in one hand. An autopsy showed McDonald had a small amount of the hallucinogenic drug PCP in his system. Part of the story being told is about McDonald’s past. He spent most of his 17 years as a ward of the state, shuttled between different relatives’ homes and foster care from the time he was 3. McDonald wound up in juvenile detention after an arrest for marijuana possession in January 2014, and among those testifying at Van Dyke’s trial this week were several current or former employees at the Cook County Juvenile Temporary Detention Center who said they had violent run-ins with McDonald. Under state law, in cases where criminal defendants claim they acted in self-defense, as Van Dyke has, judges can let attorneys present evidence about previous incidents even if the defendants didn’t know about them. But prosecutors have argued that that McDonald’s past is irrelevant because Van Dyke did not know anything about the teen when he shot him on Oct. 20, 2014. An attorney who is not involved in the case but who regularly represents police officers says it appears Van Dyke’s lawyers are using that evidence to put into context McDonald’s actions that night. According to testimony, McDonald ignored orders to drop his knife and at one point used it to puncture a squad car tire. One officer who encountered McDonald before Van Dyke arrived testified that the teenager “looked deranged” and wouldn’t look at officers as they followed him. On Thursday, the defense called a witness to bolster that portrayal: A pharmacologist testified the teen had enough PCP in his bloodstream to cause hallucinations, rage, and violence to trigger “significant bizarre behavior” and leave him dangerous to himself and others. Some see the defense strategy as darker than just trying to show Van Dyke was acting in self-defense.